Based in Copenhagen, Denmark, Demon Head is a five-piece band that self-describes itself as "Diabolic Rock". The group is fronted by Ferreira Larsen (Alucarda, Scavenger Brats) and they have been active since 2012. On April 20th, 2018 this (spooky/sinister) hard & heavy rock/doom metal outfit with release the EP "The Resistance". Limited to a mere 500 copies, this atmospheric 7" includes the songs "River of Mars" and "The Resistance". That is the running order on my promo link so we will tackle the two tracks in that manor. With truly inspired lyrics and eerie rock music to match the mood, "Rivers of Mars" is the first single from this EP and arguably the better number of the two tracks. As the promo material correctly explains, this four minute plus song will haunt you long after the EP ends! Blessed by a vocalist that would make Glenn Danzig crack a crooked smile, Demon Head has constructed a true masterpiece with "River of Mars! This two-track release is well-worth it's weight in gold for that number alone!! With that being said, the title track of this 7" is great in it's own right. The aptly-titled "The Resistance" is a slow & steady (classic rock-infused) goth rocker that (ever so slightly) flirts with doom rock and vintage psychedelic rock. There's also a little bit of jingle-jangle guitar playing going on with the title track. When you put these two cool tracks next to each other you get a slick soundtrack for this retro outfit that is bound & determined to make it's own mark in the world. 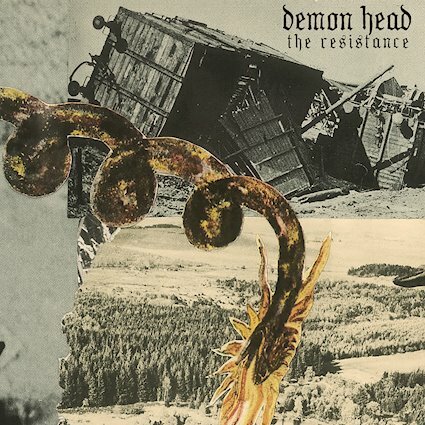 Serving as my first official taste of Denmark's Demon Head, "The Resistance" is a 7" that I plan on adding to my personal collection. For anyone that likes (seventies-inspired) hard & heavy rock/doom rock I would highly-recommend that you do the same thing too.